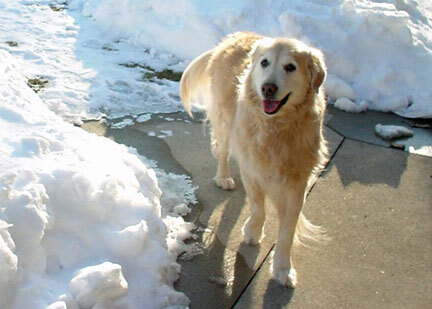 I grew up with a Golden Retriever, my husband and I lived with the one in this photo for nearly 17 years, and we were lucky enough to have two rescued Goldens after that (shown in the banner on my home page.) So you might say I’m partial to this breed. I’m looking forward to letting you in on the crazy ways of lots of breeds we’ve come to know (dogs, cats, and a few birds), but I’m afraid you’ll be reading about Goldens here a lot! It’s December 23rd today and we’ve had two male Goldens staying with us since last week. They’re here until lunchtime Christmas Day …to be followed by two more Goldens and another retriever breed on the 26th for a week. I’m in Golden heaven. We missed the familiar sight of wagging gold bums and tails beneath the tree looking for gifts last year since our last fellow passed on. These two will be spoiled rotten! We’ve had lots of dogs cross the threshold here in the past year but this week really brought back the funny quirks of all the Goldens in my life. Of course they love attention. If you’re away a lot or don’t plan to take your dog along on family outings, a Golden might not be your best choice. They’ll follow you everywhere until they’re pooped out and then try to sleep on your feet or across a doorway at the very least. Family is everything to them. They love contact of all sorts…sitting on your feet (quite often at the vet’s when they’re nervous), shoulder and neck massages, and even a few fingers resting on them when they’re snoozing. Only one of our dogs didn’t care for being touched when he was asleep, but he’d had a tough former life, so we gave him space when he needed it. They’re sturdier than some breeds so they can roughhouse, but they also hurt when they land on your feet! (The gal in the photo broke my nose twice with her hard head when we were playing in the living room…totally my fault for getting in her way when she was about to get up quickly.) They’re great with kids but watch out if playtime gets a little wild. Keep your eyes peeled for lost socks and slippers. Even the Goldens boarding with us give robbery a try. It isn’t that they want to chew them…they just want your attention. In my case it’s a tested and successful way to get me out of bed in the morning. If they’re awake…everyone should be awake. In my opinion, one of the best ways to fill a home with warmth…is to invite a Golden Retriever to live with you.